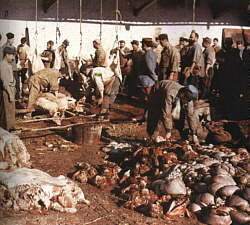 Butchering area of a French field kitchen. 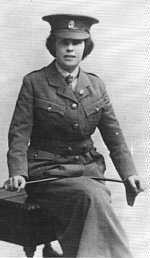 British Women's Auxiliary - possibly Somerset National Reserve. 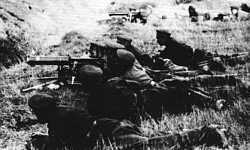 ANZAC troops advancing near Sari-Bair, Gallipoli (1915). 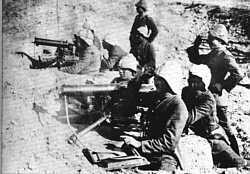 Bulgarian troops man their German machine gun near Monastir (1915). Turkish soldiers man their ever so popular Maxims outside of Jerusalem (1917). Posed German photo illustrating POW types: (from left) Annamite, Tunisian, Senegalese, Sudanese, Russian, American, Portuguese, and English (1918). 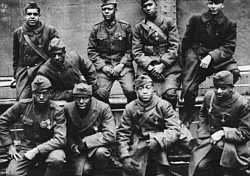 The "Harlem Hellfighters", American 369th Regiment who fought beside the French 16th Division. The longest fighting American unit in World War I, they received a total of 171 Croix de Guerre decorations (1918).